Trish and I inadvertently found this amazing cemetery while driving around Hannibal the previous day, so on a whim, decided to check it out on our way out of town. We had spotted it while driving down the river road, just south of town, heading out towards the caves and lovers leap. We had noticed the creepy looking entrance sign and dilapidated house nearby so became intrigued. 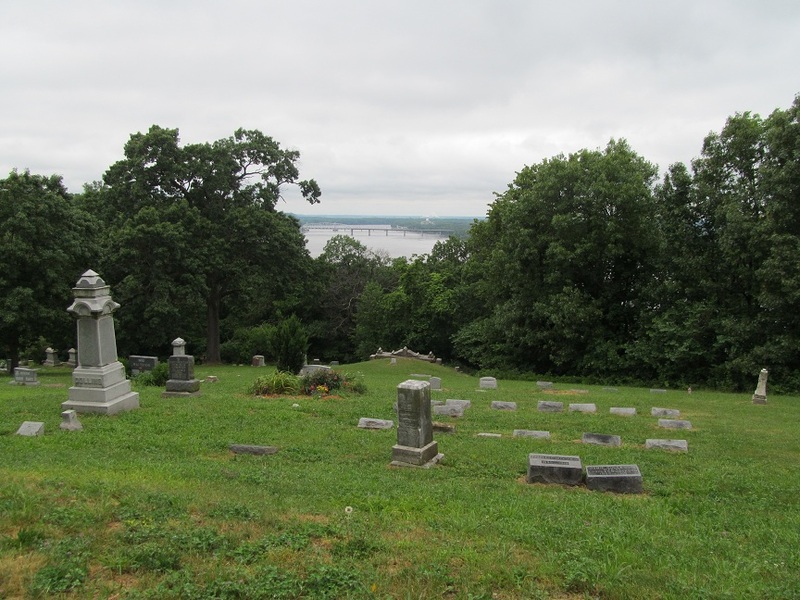 We could see nothing of the cemetery from the road but after making the winding trip up the hill on a gravel/dirt road to the top of the bluff overlooking the Mississippi River we were more than pleasantly surprised! We were expecting a little 2 acre plot of land with a couple of tombstones but found a sprawling cemetery with rolling hills and a major river as a backdrop! We started our investigation in the far northeast end and made our way back eventually to the only entrance which is located in the southwest section. Interestingly the first thing we found was a tiny, Jewish section separated from the rest of Riverside with a fence. Matter of fact I believe it may be considered a separate cemetery all together! 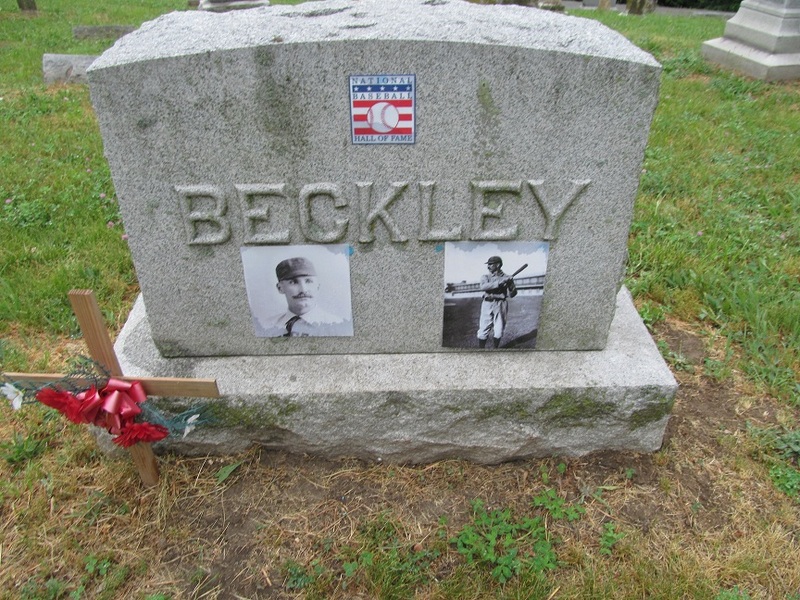 Within minutes of our walkthrough we were pleased to find the grave of a MLB Hall of Fame player Jake Beckley who played for Pittsburgh in the early 1900’s!!! We found many famous Hannibalians of wealth buried here including John J. Cruikshank who built the famous and beautiful Rockcliffe Mansion in Hannibal. He also had the largest tombstone at Riverside, and we found a solitary mausoleum buried in the ground belonging to a Cruikshank Sr. Many former Congressmen are buried here, notably William Henry Hatch, who has a monument and park named after him in town. If one were to Google mansions, and B and B’s in Hannibal you would find many familiar names marking tombstones here. While admiring the cemetery, taking pictures, and doing audio recordings we both heard numerous strange sounds coming from unknown sources, likely coming from the woods surrounding the sacred grounds. One incident however is worth mentioning. I stated we drove to the back of the cemetery overlooking the river and methodically made our way towards the entrance. I was walking around in the farthest, most isolated reaches while Trish had moved the car near the entrance on the gravel road. Trish commented she saw a bus coming up the hill into the cemetery. She actually hurried to the car and moved it off to the side of the road.. Well of course there was no bus, and it may have been impossible for a bus or trolley to even make it up the narrow, rough, winding road!! Was it paranormal? Did a reflection somehow come off the highway below? Was Trish’s imagination running wild? She is not one that really would make up anything like that being the skeptic she is. That is a question that will likely never be answered but is now filed under “S” for strange!! Being an unseasonably cool day, and having not been prepared for such a day with my clothing since it had been 90 degrees the day before, we left after about an hour. 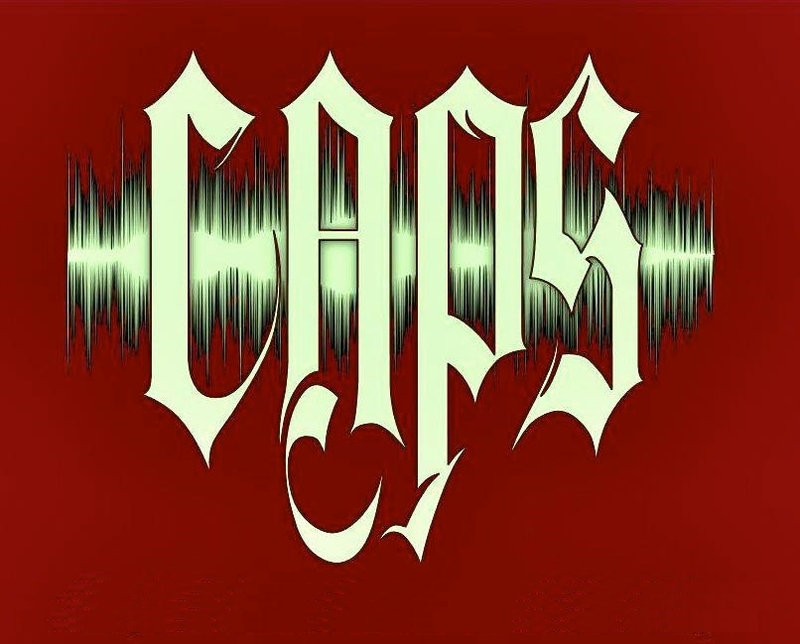 We did manage to capture some interesting EVPs in the short time and with Trish’s experience it seems we caught a lot during our abbreviated investigation. We will return for a longer, evening investigation very soon, hopefully with a better understanding of the history of Riverside, which I have had difficulty finding. Since our visit they have torn down the old caretaker’s house which stood near the entrance and efforts are underway to raise funds to continue to restore the historic cemetery. Caught this male voice that almost sounds like a name... Edmonson Cole?